American Late production M3 light tank with a D58101 version welded turret. These late production M3s were called "Stuart Hybrids" by the British. Note that it still has the sponson (side mounted) machine guns and welded hull construction. There is a star atop the turret for aircraft recognition. The sponsons were remotely fired by the driver, but were found to have limited use and were deleted in the M3A1 model. 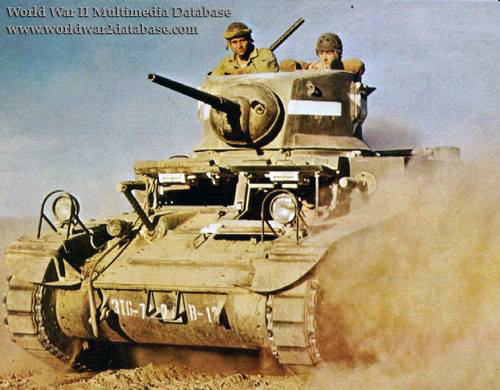 The M3 light tank - named "Stuart" by the British and nicknamed "Honey" by their crews because of its need for low maintenance and high speed - first fought in the North African desert in November 1941 in Operation Crusader. While the Stuarts broke down less than British tanks, they had limited range, firepower, and lacked sufficient armor protection. The riveted construction broke apart when hit, sending shrapnel around the turret. The gasoline engine required high octane and was prone to fire when hit. The Americans first used them against the Japanese in the Philippines; they were successful against the lightly armed and armored Japanese tanks throughout World War II. Large numbers accompanied the 1st Armored Division when it landed in North Africa during Operation Torch on November 8, 1942. With five .30 caliber (7.62mm) Browning machine guns and a 37mm (1.46 inch) main gun, the M3 looked like a potent armored fighting vehicle on paper and the 1st Armored had initial successes with hit-and-run tactics against soft targets in Algeria. However, when the 1st Armored M3s encountered the heavier German Panzer IIIs and IVs at the Battle of Kasserine Pass in February 1943, the M3's 37mm shells bounced off their German adversaries. The Germans captured large numbers of American vehicles, including M3 light tanks, and were contemptuous of the Americans' equipment. The light tank regiments were disbanded and a company of light tanks attached to the new medium tank companies that were building up. Despite being obsolete, the M3, M3A1 and M5 variants continued to serve with Britain, Australia Soviet Union and the United States throughout the war. 25,000 M3s were built, including a moderately successful infantry assault gun, the M8 75mm (3 inch) howitzer version. Date and location estimated.